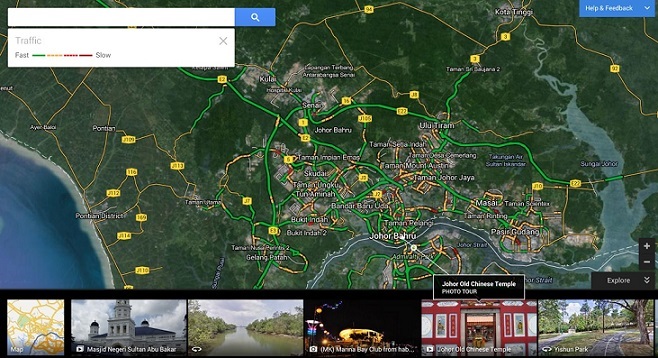 Google Malaysia has announced that its Live Traffic feature has now been extended to support Johor Bahru as well as major Malaysian highways. The new additions come less than a year after it added support for Live Traffic outside of the Klang Valley, where they were available in Penang, Ipoh and Melaka. The Live Traffic layer on Google Maps allows users to see, in real-time, the traffic conditions along supported cities. They are marked onto the roads in universal traffic colours: green for smooth traffic, yellow for slow-moving traffic, and red for bumper-to-bumper conditions. With the addition of Live Traffic for major highways along the Peninsula, users now can better plan their routes, especially during festive periods. Check out maps.google.com.my for more.